To make the Polenta Arancini, you need to prepare the polenta as per the polenta crisps, adding also the grated cheese, preferably Parmesan. You can make them as cheesy as you wish! Whilst the polenta cools slightly, prepare three plates, one with a mix of uncooked polenta combined with gluten free breadcrumbs, the other with a beaten egg, and the third with cubes of mozzarella and cubes of ham. 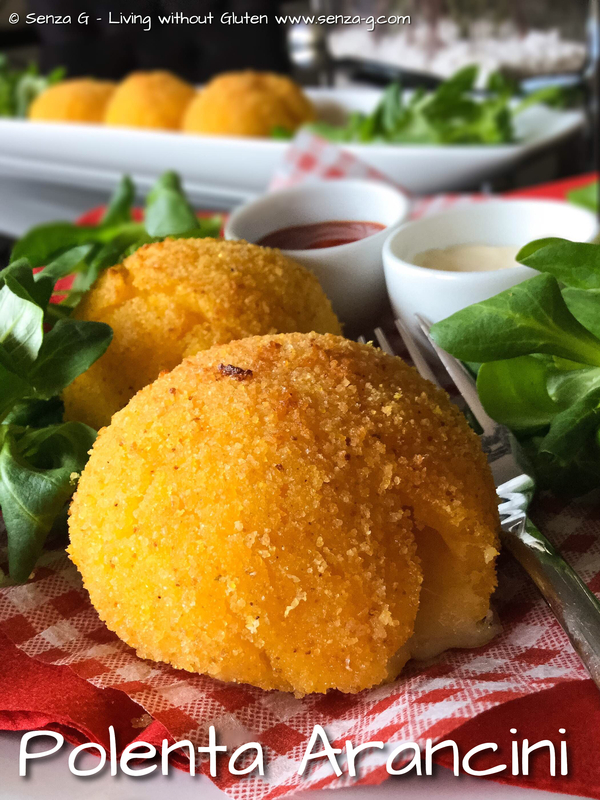 Take small handfuls of polenta and roll into balls, make an indentation in the middle and place small mozzarella and ham cubes. Close and roll the ball again. Dip quickly into the beaten egg and then roll it in the breadcrumb/polenta mix until coated. Wet your hands with water occasionally so the polenta will not stick to your hands. Do the same with the remaining polenta. Place in the fridge for half an hour. In the meantime preheat the oven to 200C. Place the arancini onto a lined baking sheet. Place some shavings of butter on top of each ball and bake until golden. You may need to put the oven on grill if you want them to brown further.